Pop Culture Lunch Box: Which Tarheel Team is the Best? So now that North Carolina has won its fifth NCAA Championship (trailing only UCLA and Kentucky in total), which of those Tarheel teams was the greatest? My vote goes to the 1982 champs, led by the greatest basketball player of all-time, Michael Jordan. 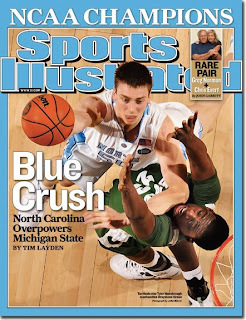 But the 2009 winners have got to be close with Tyler Hansbrough, arguably the best player in NCAA history (and somehow projected to be picked 43rd in the NBA Draft this summer). I rank them 1982, 2009, 2005, and the Eric Montross/Donald Williams championship team of 1993 as honorable mention. A good summary of the players, coaches, and key wins of all these teams is here.